Sheila Yahyazadeh, senior consultant of KPMG’s Federal sector, said that Federal agencies’ disappointing scores on the Federal Information Technology Acquisition Reform Act (FITARA) report card could be an opportunity for learning and growth. 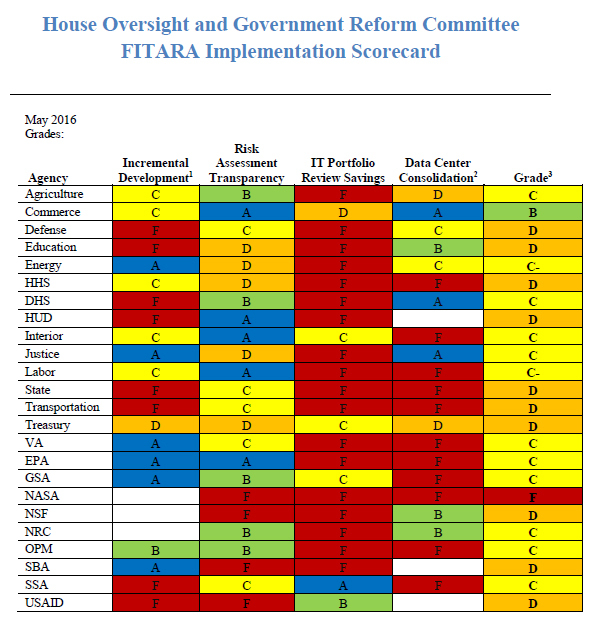 The scorecard measures how well agencies are enacting FITARA’s mandates, assessing data center consolidation, IT portfolio review savings, risk assessment transparency, and incremental development. Many agencies did not perform well on the most recent scorecard, which was issued in May. The Department of Commerce (DOC) scored the highest, with an overall grade of B. Many agencies received Cs, and the National Aeronautics and Space Administration (NASA) received an F. Yahyazadeh, who spoke at ServiceNow’s NowForum, said that FITARA can lead to integrative thinking between agency leaders and business partners. “While the news wasn’t great for a lot of them, I see this as a place to reverse engineer the problem,” Yahyazadeh. While she said that it may take a year for Federal agencies to start improving their score on FITARA, she encouraged government leaders and their business associates to “lean in” to the act. Yahyazadeh said including key stakeholders in developing solutions can lead to innovative collaboration. She also said that ServiceNow’s platform, which allows employees to manage services across a variety of fields, could be valuable to Federal leaders in their FITARA compliance efforts.